Home > Timothy Bailey Jr.
At the end of September in the early 1980s, a young man named W. Timothy Bailey, Jr. was born into a musical family. The Kansan fell in love with the art around age 3, beating pots and pans, listening to jazz and gospel. By age 11 he was writing lyrics, and by 13, he was crafting tracks when not practicing violin or viola. Timothy studied at the Youth Performing Arts School in Louisville, KY as a sophomore and junior in High school, and graduated from Sumner Academy of Arts and Science in Kansas in 2002. Prior to moving to Los Angeles in 2004, Timothy majored in music technology at the Kansas City Kansas Community College where he also sharpened his jazz chops. 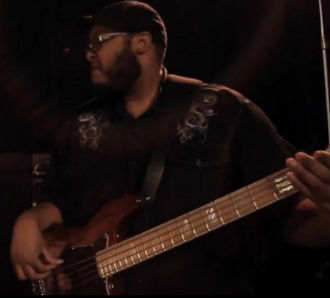 During this time Timothy also became a first call bassist on the KC gospel scene, accompanying legends like Richard Smallwood, Kim Burrell, and Dr. Bobby Jones among others. In 2005, Timothy graduated from the Los Angeles Music Academy, where he furthered his bass studies on a full scholarship. While in LA, he's been blessed to accompany artists like Denice Williams, Chante Moore, Kenny Latimore, Natalie Cole, Ahmir "?uestlove" Thompson, Natasha Beddingfield, Too $hort, Brian Kennedy, Rachelle Ferrell, Judith Hill and many more, playing legendary venues like the Key Club, the House Of Blues, the Hollywood Bowl and everything in between. Timothy has appeared on television shows such as CDUSA, the KTLA Morning News and the Ellen DeGeneres show. He's traveled the country with the likes of Chris Brown, El DeBarge, Tyrese Gibson, J*Davey, Jamie Foxx, Lalah Hathaway, Gary Taylor and Billy Davis and Marilyn McCoo of 5th Dimension. Timothy spent a portion of 2006 touring with the award winning play "U Don't Know Me - The Musical", and in 2009 spent a month in Italy with Tyscott recording artist Cedric Ford and Heart Of Worship. Lately, the bassist has been working with some of the world's most notable musicians like The Tonight Showís Paul Jackson, Jr, Wayne Linsey and Teddy Campbell, Soul Seekers John "Jubu" Smith, and Nisan Stewart, producers and world-class musicians Terrace Martin and Mike Bereal, and many others. Mr. Bailey is also quite active in the studio. His bass stylings were featured on Hidden Beach's Unwrapped Vol. 7 Back 2 Basicsî (where he played nearly all of the bass on the album). Tim, also become a trusted session musician for producers like Laythun Armor (Anita Baker, The Winans), JR Hutson (Jill Scott, Musiq Soulchild) and Boom Batt Productions (Nelly, Bobby Valentino). To date, the 28 year-old, who now goes by "Twizz" or "t.bailey", has placed songs on many major and independent albums. Among those, rapper Mims "Music Is My Savior", Rahsaan Patterson's "Wines and Spirits", and the Tamela Mann (of Tyler Perry's 'Meet The Browns' fame) project entitled, 'The Master Plan' which spent over 50 weeks in the top 10 of Billboard's Gospel charts. He also produced and mixed the latest Terrell Carter ('Crazy Lunatic Psycho Fool') and Josh Vietti ('Street Violin') projects in their entirety. Television shows that have featured his music include MTV Cribs and Laffapolooza. The ASCAP member who's production was featured on albums nominated for Stellar Awards and BET Awards, grabbed the attention of FoxxKing Entertainment and BUG Music, who signed Timothy to a publishing deal in 2008. Twizz' name and production company "TooTwizzlin Productions" can be found along the pages of Billboard, XXL, Soultracks.com and Giant Magazine. Timothy (now a husband and a father) serves as Music Director/Minister of Music at Community Bible Church in Pasadena, CA. He is the founder of the band called, 'The WUNs (Whatever U Needs)', co-founder of The WUNs Group (www.thewunsgroup.com) and co-founder of the new production group, 'The Beat Traffickers.' But he'll be coming soon to a city, country, radio or television near you.